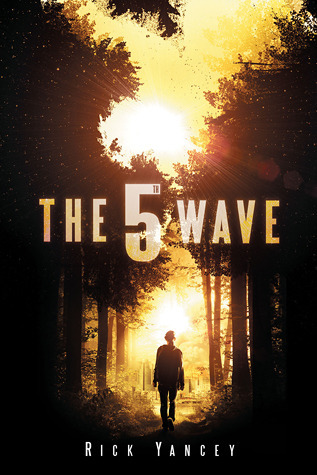 Presenting The Fifth Wave #1 The 5th Wave by Rick Yancey. Aliens have taken over the world again. This is my first Rick Yancey book and while it is getting quite the hype, I do believe it deserves every bit of it. Of course aliens taking over the human race is nothing new and aliens in the guise of humans is also not new but you will love Yancey's approach. He focused his story on the aftermath of the invasion and telling us of this grim and gritty world post take over. Of course, the hyped commodity does not always live upto its expectations but here's the thing, you are definitely not going to be disappointed with this one. The 5th Wave deserves its genre credibility as a post-apocalyptic dystopia. Aliens are here. You can clearly see that hulking big mothership hung up there in the sky and instead of big eyed green monsters coming in arms ablaze, they take the subtle approach. They use our own planet against us. The 1st Wave, lights out. The 2nd Wave, Surf's up. The 3rd Wave, Pestilence and the 4th Wave, Silencer. Tensions and suspicions are sky rocketing. You can't really trust your fellow humans because the others have taken over a certain percentage of us. Then comes the 5th wave. Nobody really knows what that one will be. Maybe its already happened. Maybe it is happening all round them or maybe it has already happened while the smart few have hidden themselves. And Cassie, fierce and smart is up and about in this silent & strange new world with only an M-16 and her brother's teddy bear for company. The brother for whom she searches for relentlessly hoping against hope that he is still alive and that she had not failed in that one promise she made to him. Alone against the world, a philosophy that has kept her alive till now but she soon realizes just how out of depth she really is ...... How alone! Such circumstances lead her to the mysterious Evan, who takes her in after she gets shot. She understands her situation. She understands who Evan is but at heart she knows that she won't be able to do it alone and craves the company. And Yancey portrays this soft, suspicious, tense yet warm are to perfection keeping us on tenterhooks waiting for the penny to drop. We also meet Zombie, Ben Parish really. A colligation that fits. Whereas Cassie tells the story of the aftermath and how the human race copes. Through Zombie we get the most action packed arc. The government is putting soldiers on the front, the children, the last line of defense. Its is sick really, reading about it, putting kids as young as seven in the firing range but the author plays it very nicely. The realization...... the ultimate betrayal. The reality of Camp Heaven. We come to know all this and gasp at the right places as they are revealed. Making them finally meet .... The actual 5th Wave ..... Rick Yancey did a pretty bang-up job holding in all the pieces and showing his hands one by one, at the perfect time. Leading to the final confrontation. Perfect world building, perfectly developed characters and an amazing plot. This is a 457 paged manuscript and I tell you you truly must not pass it up. "The 5th Wave is a genius and brilliantly developed page turner"
I LOVED the alien lore in this one. The fact that you didn't know who you could trust is what made me love it so much! I have been putting off reading Infinite Sea becuase...I'm afraid. I here it's very much a placeholder for the series. Blah. I loved this one! Especially the twists at the end? Oh! Rick Yancey caught me off guard. It was ingenious! Definitely worth the hype. I've always avoided this one because of the hype! But now that I hear it's worth it, I'm definitely giving in and picking it up! !